Is Sunday the Correct Day to Worship? Is Sunday The Correct Day To Worship On? Ever wonder why God said, REMEMBER the seventh day to keep it holy? Its the only commandment God felt he needed to remind us to remember it. He could see into the future and knew Satan would try and counterfeit God's Sabbath. And God wanted us to remember that he told us to remember his seventh day the Sabbath. Those are strong words from Jesus' disciple. Is he talking about the majority of Christians and Christian pastors in churches today? I'm sure of it. Even Sabbath keepers need to take a step back and look at their spiritual status. If someone tells you the 10 Commandments are no more because we are under grace and are already saved then think twice. If we don't have laws its not of God but Satan. Another thing we would like to throw in there while your thinking. If you listen to your pastor and think you go straight to Heaven when you die, then why does Jesus need to come back to Earth to resurrect all those who sleep in the ground waiting for Christ to return? Wasn't that the first lie Satan told us humans. "You won't die, you will be like gods." Now aren't we feeding into the devil's lies again? We won't die we will just go to a better place up in heaven. But that's another subject that we have a Free book for. Just go to the Home page and fill out the Book Request Form. Lets say Jesus changed the day to Sunday even though we know the Catholic church brags about changing the Sabbath to Sunday. But lets say Jesus changed the 4th commandment to remember Sunday the 1st day of the week. How stable would God's kingdom be if he made laws then kept changing them. Worship me on the 7th day, no i changed my mind, on the 1st day now. I'm sorry I changed my mind, a new law, worship me all 7 days.Kings in the Bible couldn't break or change their own laws. Take for example Daniel and the lions den. King Darius Loved Daniel, but was tricked into making a law that for a number of days only prayers could be offered to him and no other Gods. The King sealed the law with his seal and could not be broken. The king was crushed when he found out he was tricked and Daniel his friend had to be executed. The King himself could not take back a law he had sealed. We all know what happened next. Another example is Esther. The king sealed into law that all Jews must be killed. Well he found out later his own queen was a Jew. The king could not do away with his law so he made another law saying the Jews had permission from the king to defend themselves against their attackers. And we know what happened next.How much greater of a king is our God? He can't say do as I say but not as I do. No he sets for us an example. He makes a law and does not change it. It would be easier for Heaven and the Earth to pass away before one jot of God's law passes away. Jesus said if you love me, follow my commandments. Jesus kept the 7th day. The disciples kept the 7th day. Paul kept the 7th day. 1000 years after Christ death Christians were still keeping the 7th day. Catholics kept the 7th day until they decided to show the world the power of their church. You might say how do we know Saturday is the 7th day? Well the Jews don't believe Jesus was the son of God. And they still worship on Saturday and always will. They are so far wrapped up in tradition that they are blinded. They believe Jesus was a prophet. But how can they say that when Jesus said he was the son of God. This means if he was a prophet then God's prophet was a liar! Nobody can make the Jews give up the Sabbath. Not Satan and not Hitler. Even our own scientists claim Saturday is the 7th day of the week and our Calenders reflect it.Most people feel Sunday is the 7th day due to a 5 day work week with the weekends off. Sunday being the last day before starting a new work week or school week. Satan is very clever and crafty. We need to be on our toes at all time watching for the creeping compromises and recognizing the creeping compromises that we have been involved in without even knowing it. Pray for wisdom as King Solomon did and ask for a double portion of the Holy Spirit as Elisha did. OK in the last days we need to pray for our flight not to be on the Sabbath? But the Sabbath is for the Jews? Or did Jesus get it wrong? Makes you think doesn't it? Hmmmm, so in Heaven will we be keeping the Sabbath or Sunday? But, you may be thinking, can the majority of Bible believers be wrong on this Sunday/Saturday issue? Let me ask you this, weren't the majority of Bible believers walking in error at Christ's first coming? History repeats itself over and over again. If you ever read the bible from cover to cover you will see that the people keep making the same mistakes over and over but thankfully we have a patient God. God doesn't change, people do. Final thoughts: James says if you know its right/good and you choose not to do it, God sees it as sin. What do you think is right? The 1st day of the week or the 7th day of the week? Sunday or Saturday? Is the accusation true, that Protestants accuse you of? 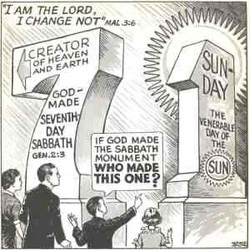 They say you changed the Seventh Day Sabbath to the, so called Christian Sunday. Identical with the first day of the week. If so, when did you make the change, and by what authority? (1) That Protestants, who accept the Bible as only rule of faith and religion, should by all means go back to the observance of the Sabbath. The fact they do not, but on contrary observe Sunday, stultifies them in the eyes of every thinking man. (2) We Catholics do not accept the Bible as the only rule of faith. Besides the Bible we have the living Church, as a rule to guide us. We say, this Church instituted by Christ, to teach and guide men through life, has the right to change the Ceremonial laws of the Old Testament and hence, we accept her change of the Sabbath to Sunday. We frankly say "yes," the Church made this change, made this law, as she made many other laws, for instance, the Friday Abstinence, the unmarried priesthood, the law concerning mixed marriages, the regulation of Catholic marriages, and a thousand other laws. "Of course the Catholic Church claims that the change [from Sabbath to Sunday] was her act. And the act is a mark of her ecclesiastical power and authority in religious matters." -C.F. Thomas, Chancellor for Cardinal Gibbons of Baltimore. Roman Catholicism has decided to exhibit her presumed supremacy over God's law by changing His day of worship, the seventh-day Sabbath of the 4th commandment, to Sunday, and announces this change as a mark worship a created being over the Creator, which is precisely what worshiping the beast and receiving his mark entails. Q. Many Christians keep Sunday in the sincere but misinformed belief that they are obeying God. Do they have the mark of the beast now? A. When the rightful supremacy of God's law is clearly brought before all, then whoever shall trample upon that law to obey a human enactment receives the mark of the beast; he accepts the sign of allegiance to the power which he chooses to obey instead of God. The warning from heaven is: "If any man worship the beast and his image, and receive his mark in his forehead, or in his hand, the same shall drink of the wine of the wrath of God, which is poured out without mixture into the cup of His indignation." (Revelation 14:9, 10). But no one is made to suffer the wrath of God until the truth has been brought home to his mind and conscience, and has been rejected. The vast majority of Christians have been taught to observe Sunday as God’s holy day in honor of the fourth commandment—but is it right? 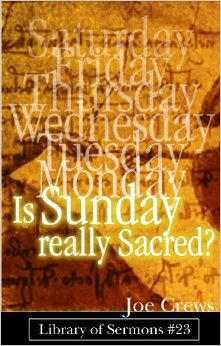 This brief but thorough book examines Bible texts that refer to Sunday and whether those texts really make Sunday sacred. 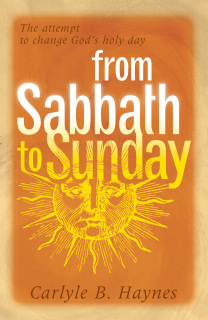 A brief but comprehensive history of the Sabbath, this book tells of its transfer from the seventh day of the week to Sunday. 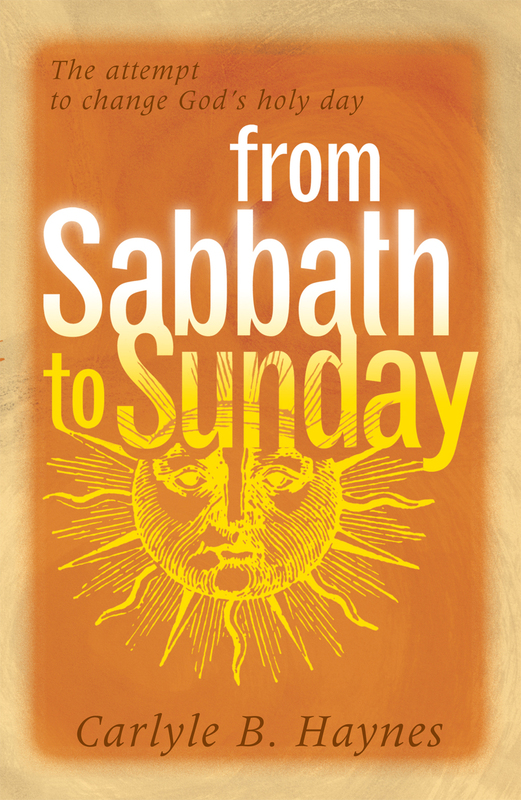 From Sabbath to Sunday is Carlyle B. Haynes' fascinating study of the historical aspects of the Sabbath question, showing how, when, why, and by whom the change was made from the seventh to the first day of the week.